We are Fabian Fischer and Dario Reinhardt. We are game designers. 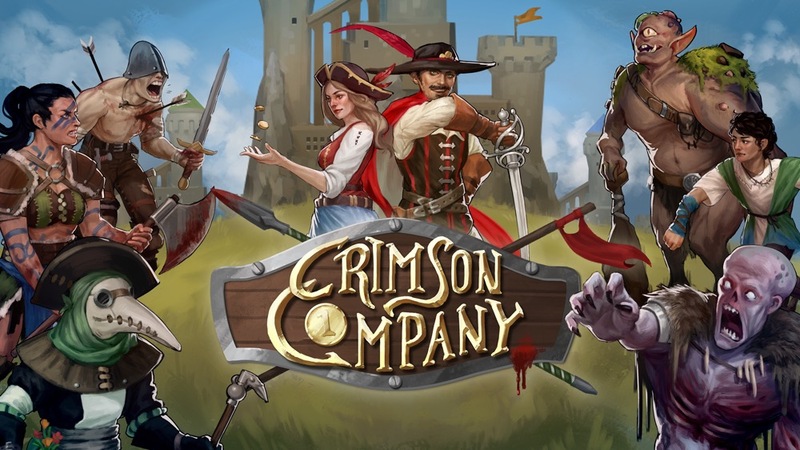 And we created a card game that breaks into uncharted territory in multiple regards: Crimson Company. Over the years, we sank countless hours into all kinds of physical and digital card games. Of course there were quite a few that we really liked. However there were always some things that damped our enjoyment when it came to playing them competitively in the long run. Hence at one point we asked ourselves: Why not develop a game ourselves? We wanted to bring together the strengths of our favorite card games, while at the same time doing away with their weak points and, of course, add our own spin on top. The following article will outline the development of the game's core concept, as well as some of the fundamental design decisions on the way towards the novel core mechanism of "board drafting". At first, let's look at some of the awesome games that inspired us, one way or another. Obviously there's Magic: The Gathering, the forefather of all card battling. 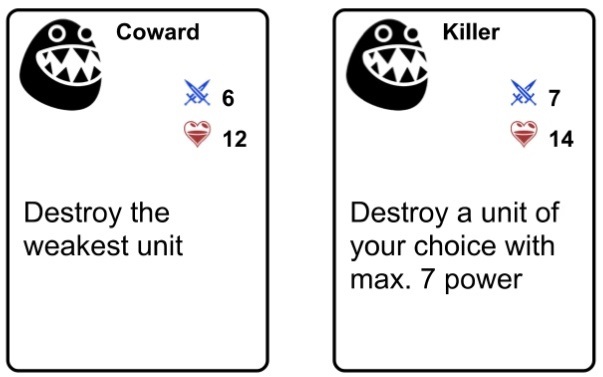 The strong duel character of the game and the accessibility of hiding large parts of the rules on the cards themselves are cornerstones of many designer card games to this day. Hence we didn't want to fiddle with those fundamentals. However, the relevance of luck in drawing cards (see "mana screw" or "mana flood") was a very different story. Also, we were bothered by the fact that you pre-assemble decks essentially detached from the core game itself. Players depend strongly on their card collections which generally results in a rather unfair competitive environment. And of course the luck factor is amplified as well, when certain matchups are incredibly favorable for one of the two competitors. Gwent has similar problems in general. But it reduces the influence of card draws and random effects during a match drastically compared to Magic or Hearthstone. For us this marked a step in the right direction in terms of competitive viability. Another remarkable gameplay element of Gwent is the round structure, which adds interesting dynamics and quite a bit of depth to the game. There was still the problem of pre-constructed decks though. One game that tried to do away with this was Dominion and the genre of deck-building games that followed it. 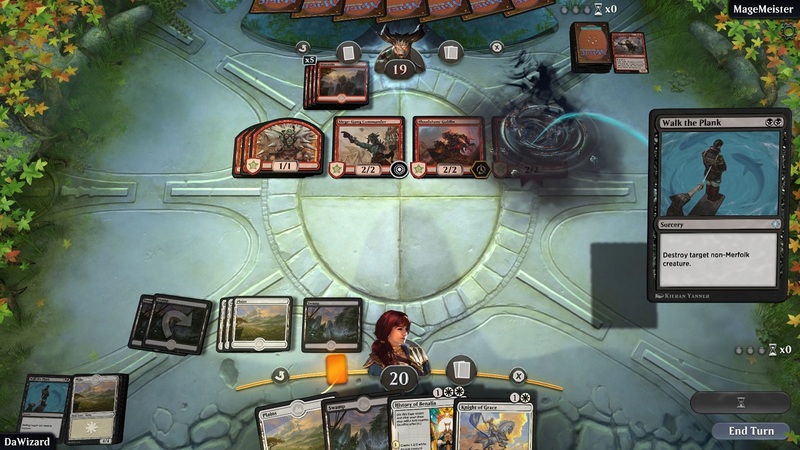 In those games players build their decks anew in every match as part of the core gameplay, trying to find synergies and reacting to the deck-building choices of their opponent on the fly. Since all players go into a match with the same starting deck, it's a much fairer situation than in traditional collectible card games. On the other hand, Dominion suffered from relatively static drafts. Players more or less decided on the best combinations of available cards in the first round and then just had to execute that strategy for the rest of the game. Also luck still played quite an important role given the high rate of card cycling in the game. Especially the latter problem is one that later entries to the genre such as Ascension or Star Realms didn't solve either. Inspired by deck-building, real-time strategy and Chess, Prismata emerged as a kind of "counter design" that tried to push competitive viability above anything else. Players didn't have private collections of cards, they didn't build their own decks, and they didn't even hold a hand of cards. Instead in every match, they assembled an army of attackers and blockers from a random set of available units. Instead of putting those in a deck, they directly put them into the battlefield. You could call the core mechanism "board building" in this case. A big strength of the game is how every match generates new situations and unit combinations. However, in contrast to the aforementioned games, it doesn't use a draft format. Both players access their own supply of units and buildings. This is one aspect where we wanted to introduce changes to the formula: player interaction could be more direct. On top of that there is no randomness or hidden information at all in Prismata. While this of course makes the game a great fit for tournament settings and eSports, it also puts a lot of pressure on players to plan and calculate turns in advance, which can shrink the target audience a bit. Last but not least, we should mention the board game genre of "Eurogames" (or "Designer Board Games") as an influence. Titles such as Race for the Galaxy, Terra Mystica or Through the Ages stand for long-term strategic decision-making and building so-called "engines". Players have to evaluate how much value they are probably going to get for a specific action at any given point. Those kinds of decisions are highly situational and deep. They not only have to take into account the strategy of the opponents, but also the estimated length of the rest of the game. This depth, however, often comes with a high number of components, long setup times and a complex ruleset that requires a lot of time and effort to get behind. "This can surely be done in a more accessible way!" we thought. offer variety by creating a different experience in every new match. As if that weren't enough, we also wanted to provide a completely fair metagame. Players should start on even ground in every match. Hence there couldn't be private card collections. The winner of a match should not depend on owning a lot of cards or pre-constructing the perfect deck. The decisions made during gameplay were supposed to be the decisive factor. So we sat down, theorized and experimented with some prototypes. And we ended up with a novel kind of core mechanism. In the beginning we just went down a road of consequent design decisions: If players don't bring their own decks into the game, maybe they shouldn't even hold a hand of hidden cards. Ultimately that would strengthen the competitive nature of the game even more. At the same time we want to confront players with an ever-changing offer of draftable cards throughout the game, with both players competing for the same pool. 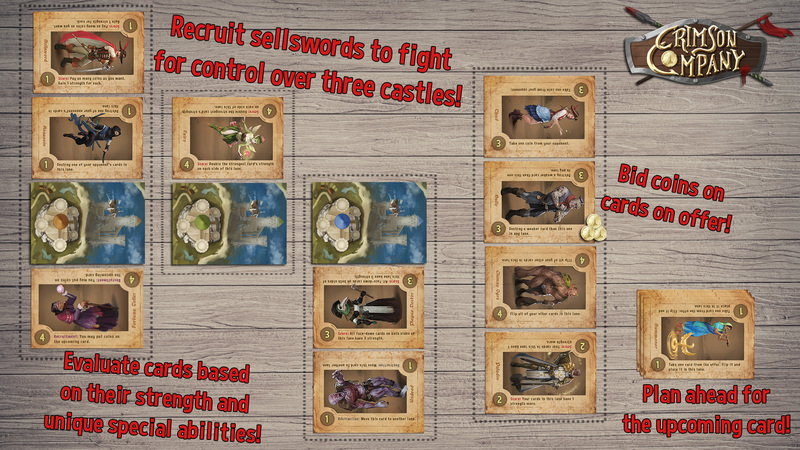 Our solution: Cards acquired from the offer are put into play without taking a detour into a deck or a player's hand. In the end the draft offer became our only element of randomness in the game. It ensured players would have to deal with new kinds of situations all the time, as is the strength of a card game, but the role luck played in the outcome would still be very minor. On top of that we generally wanted cards to stay in play a persistent entities, to make the decisions more complex and interesting throughout a match. Therefore we decided relatively early on making each card represent a character or creature. And thus a "board-drafting" game was born. Each card features a strength value and a unique special ability. We deliberately didn't want to introduce other card types - such as "spells" - to remain as accessible as possible. Instead every character card comes with an individual special ability in addition to its "body" in the form of a strength value. But where would players place the cards? We wanted to go for a spatially relevant structure that to visualize the current game state at all times and allow players to intuitively grasp what's going on. After all, gameplay decisions should not just depend on the mathematical value of actions. That's how we ended up with dividing the board into three columns (or "lanes"). To makes those lanes as meaningful as possible, we also decided to directly connect them to the victory condition of winning two out of three lanes. This gave our game a Gwent-like round-based structure. However in our game, players would fight for all three "rounds" at the same time, making the overall experience even more dynamic. Not only did we want deliberately giving up a lane to be a valid strategy at times, but also keeping a lane open for a long-term benefit. That's where the economic aspect of the game came in. As is the case in many Eurogames, we also wanted to feature "engines" in our game that generate value over time and reward planning ahead. Obviously it makes sense to tie such mechanics to the resource system. In our case there was only one central resource, again for the sake of simplicity. However this one resource had to be flexible enough so that the value of specific characters would fluctuate depending on the game state and require complex evaluations again and again. Not the easiest of premises. Initially we experimented with every card having specific "upkeep costs". Depending on how high your total upkeep was compared to your opponent, you were able to play more or less expensive cards. We tried to introduce a basic tension into the game that way and make it impossible for players to get too far ahead in a match. Ultimately that system just lead to balancing troubles and forced players to do lots of basic arithmetic though. Early prototypes featured cumbersome "upkeep costs". From there we simplified the system by introducing an independent resource: coins. At the same time, establishing a regular income each round also gave us a great starting point for our engines. Putting pre-defined costs on cards made less and less sense. After all the value of a card would always be highly dependent on the board situation. Either you leave the card to your opponent. Their money goes to the bank and they get the card. Or you match the bid. In that case though, your opponent not only gets their coins back but also your coins you used to match the bid, essentially doubling their initial bid. In that way players always have an incentive to force their opponent to make a difficult decision. A good bid will hit the sweet spot between the utility a card has for you as well as the price your opponent would be willing to pay. In future tests, the bidding mechanism introduced a whole lot of back-and-forth gameplay and regularly lead to close matches and dramatic turns. A few "proof-of-concept" prototypes later we had locked down the fundamentals of our game: a card game without decks, hands and defined card costs. Such a novel kind of system of course needed a vast number of test runs. In line with this, further development was mostly based on iteration. Especially regarding the cards' effects, we soon realized that streamlining was of utmost importance. While we tried to come up with complex combo systems early on, we soon realized that we didn't even need to enforce anything in this area. The base gameplay had enough complexity and potential for synergies, so that we could keep the individual character abilities relatively simple and elegant. Over time the game became more and more accessible without missing out in terms of depth. 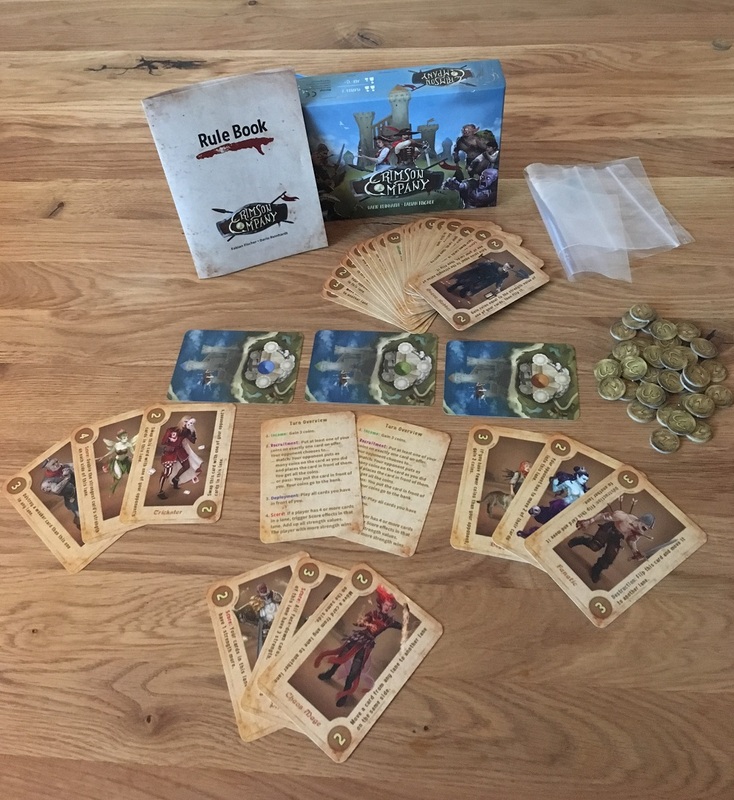 From the feedback we received in countless playtests and tournaments with dozens of rotating players (as well as a print-and-play campaign on Kickstarter), we were able to devise plenty of optimizations of the game's rules. For example the random reveal of the top card of the deck was found to be a pretty annoying element that hurt the competitive direction of the game quite a bit. The player whose turn it was could immediately bid on that card, while their opponent had not been able to take it into account for their own game plan the turn before. 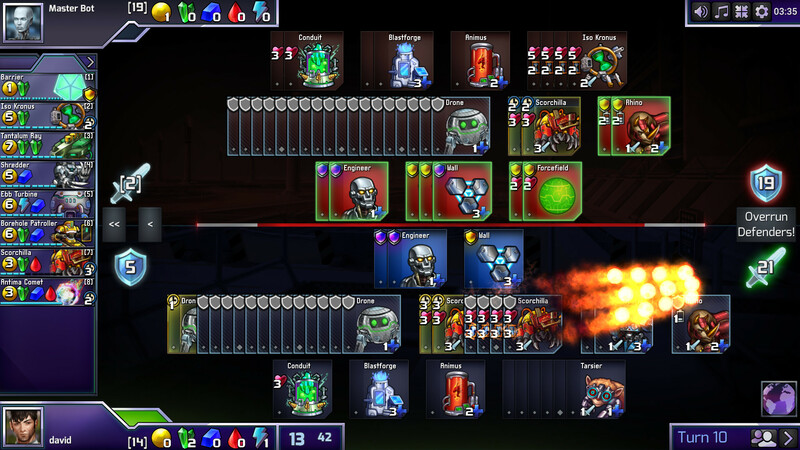 That's why, in the final version of the game, the upcoming card will always be visible as a preview on top of the deck. Throughout our testing process the game became a full-fledged product more and more. 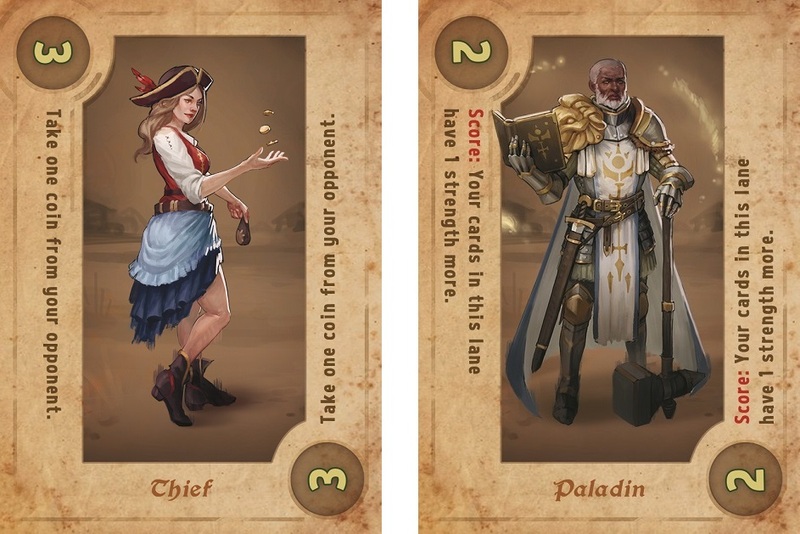 We started having our own artwork made (by Janna Sophia) and kept refining the layout of the cards (with the help of Mario Veltri) for each new test round. Right at first glance you'll notice that we made an effort to have a really diverse set of characters. To make a point, of course, but also in trying to make all cards as recognizable as possible. With the same goal in mind we chose our setting: Players assemble armies of sellswords - from paladins and axe-women to ogres, fairies and other mythical creatures. In doing so, they try to conquer the majority of castles within the kingdom. 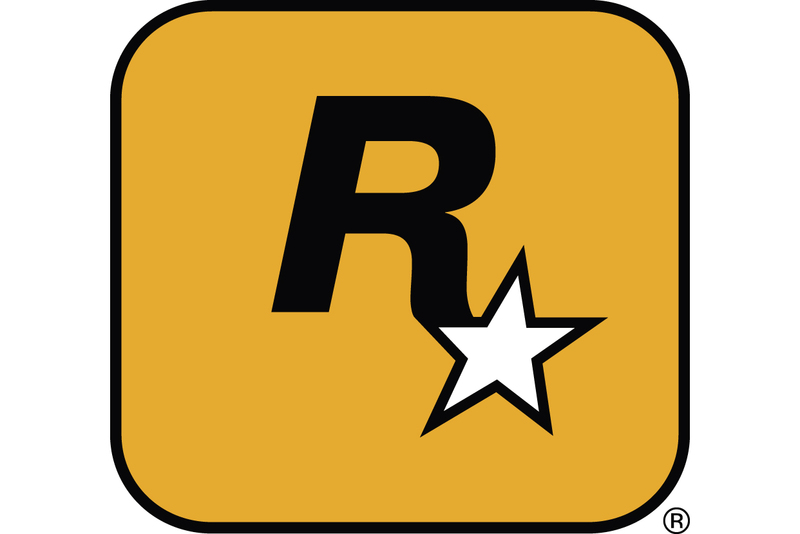 In terms of gameplay the first edition of the game is focused on a core set of 30 unique characters. However, given all the possible combinations of the four cards on offer and the draw order of the deck, there are already countless variants of how a match can go. A lane is scored when one players has gathered at least four characters in it. Whoever prevails in two lanes also wins the game. That's all players need to know to start bidding and fighting. For experienced players a full match takes around 20 minutes. After about one year of development we're confident to have arrived where we want to be. The game meets our design goals without resorting to convoluted rules. We found our "proof of fun" in hundreds of playtests including casual players as well as card game veterans. And in terms of art and layout we were lucky to work with incredibly talented individuals. Whether the game will attract wide interest or not, is a different question of course. In any case we're convinced that our innovative project will contribute to progressing the card battle genre. And for us as game designers, that's a considerable success in and of itself. Nevertheless we're of course super grateful for every visitor on Facebook, Instagram or our Discord server, and every box we manage to sell! In the end it's the players and the moments of tension and excitement they experience in every match that make Crimson Company come to life.